Welcome.We hope you enjoy your riding at Thompsons Horse Centre. 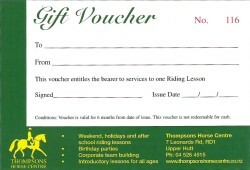 We offer quality riding instruction in both our indoor and large outdoor arenas, and ride-outs on the exercise track. We cater for all levels and ages (beginners to advanced), and are open Tuesday to Sunday, with evening classes during the week. 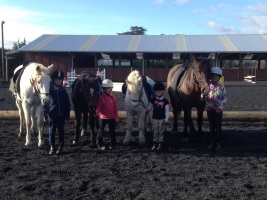 We have a good range of schooled horses and ponies to learn on. We offer group and individual lessons. Payment: Cash, cheque or Prior Internet bankingPlease try to arrive 5-10 minutes early so you are ready to start at your allotted time. All booked lessons that are cancelled will incur a $30.00 fee unless 48hrs notice is given.